We are delighted to announce a very special fund raising event, especially for those with an interest in life writing and memoir. Founding trustee Dame Fiona Kidman will be running a one-day seminar, offering skills for writing your personal stories, whether for publication or family record. This follows the sought after workshops she has been running over the past four years. Venue: Thistle Inn, Mulgrave Street, Wellington. This is a wonderful opportunity to learn from a prize-winning author of more than thirty books, which include two volumes of memoir. Numbers, we are sorry to say, are strictly limited so get that form in quickly! 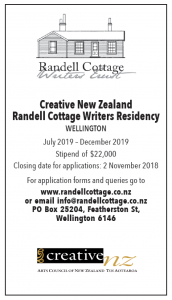 All proceeds will be donated to the Randell Cottage Writers Trust. This entry was posted in Friends, Writers. Bookmark the permalink.